It’s only been about half a year since I reviewed the very good Eldritch album Blackenday, so it would be a little early for yet another new release. Instead their label has been working on the Italians’ back catalogue, and after re-issuing their first two albums Seeds Of Rage and Headquake, we get this time their third CD El Niño from 1998. Normally I don’t see much sense in re-releases, but Limb Music took care to make these Nineties prog metal classics more attractive by adding lots of bonus material. 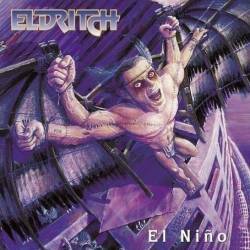 El Niño comes with six unreleased tracks that are mostly demo recordings of songs that didn’t make it to the final album, and the Yngwie Malmsteen cover version Dreaming should be of interest for collectors too. Apart from singer Terence Holler (a pseudonym, possibly because of his hollering voice?) and guitar virtuoso Eugene Simone, there are no members left in the current incarnation of the band. Further notice should be given to keyboarder Oleg Smirnoff who marked the music deeply with his varied playing. In their early career, Eldritch were not as hard as they are now, and emphasised their prog components more than their power metal sound that they concentrated later on. But that doesn’t mean that El Niño is a bad album, far from it. In fact you hear a band that is in the midst of its development, writing compact prog metal songs that rarely are longer than seven minutes, and put much more importance on cohesive songwriting than on technical trickery. Scar has modern keyboard sounds, The Last Days Of The Year is a half-ballad that actually works, To Be Or Not To Be (God) is a wink at their more technical days, From Dusk Till Dawn is astonishingly straightforward, the title track has a festive atmosphere. I could go on about all the fine aspects of this album that proves mostly one thing: that it has survived the test of time without a scratch. Fans of Dream Theater should check out this slightly overlooked prog metal gem of the late Nineties. The original 52 minutes are supplemented by generous 25 minutes of bonus material. The only stale fact is that the label sells the album for the price of a regular CD, punishing thus the band’s loyal early fans who have to spend once again between 15 and 20 Euros if they want to get hold of the bonus material.